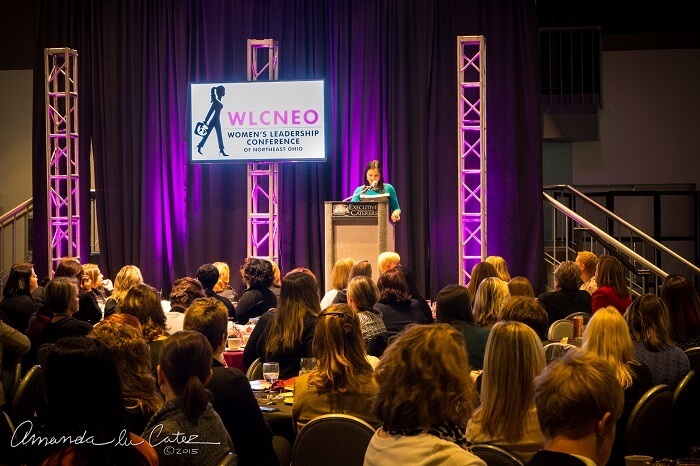 Last October, I attended the inaugural Women’s Leadership Conference of Northeast Ohio (WLCNEO). A coworker of mine created the conference because she noticed that, similar to many cities, there seems to be a glass ceiling on women in business within our region. She wanted to create an environment where successful women in business could mentor and teach one another by sharing their experiences. From there, she decided to do something to prove that women can be leaders not only in C-level roles, but in any position. She wanted to create a conference that could help women at any stage in their career and connect the many successful women in the area. She recruited speakers across a variety of industries, including an Olympic gold medalist, CEOs, CMOs and many other top-level women. The WLCNEO was born. Below is a snippet of what I learned from each speaker I had the honor of listening to at the conference. It was inspiring to hear their stories, and I hope that other women can learn from them. Build relationships with your team. The morning keynote speaker was Donna Ramadan, Director of Market Solutions for University Hospitals. Ramadan spoke about her experience transitioning into a new leadership role and how she had to adjust her leadership style to fit the new work culture. She stressed the importance of servant leadership. She learned to build personal relationships with her employees to improve morale and productivity, while reflecting on her own contributions if the team failed. Value your negative experiences. The second breakout session I attended featured Laura Bennett, CEO and Co-Founder of Embrace Pet Insurance. Bennett’s session was informative and kept me laughing the whole time. Her witty presentation gave advice on career transitions, and she reminded us that it’s never too late to take the next step towards your professional goals. Lissa suggested that even negative work experiences can have a positive impact on your future professional self. Though we might not realize it at the time, every experience is a learning opportunity. Persevere and then persevere again. Our lunch keynote was Dominique Moceanu, the youngest Olympic gold medalist in U.S. gymnastic history. Moceanu has a very unique and inspiring story full of setbacks and unbelievable happenings. She gave an overwhelming air of perseverance, and described many negative experiences that she was able to turn into positives. She is truly an example of a young, successful woman who has chosen to take control of her own life. There’s room for more than one woman at the board table. The final keynote of the day was Jayne Juvan, Partner at Roetzel & Andress, LPA. Jayne talked about integrating one’s work and personal life. Her personal experiences influenced her professional journey to becoming a partner and social media guru. Jayne also spoke about the misconception that there is only room for one woman at the top of any given company and how that fear can make women work against each other rather than with each other. It’s important now more than ever for women to mentor each other and to create positive relationships in the workplace. I left the conference feeling inspired and did what any good networker would do: I connected with the women on LinkedIn! I look forward to the WLCNEO coming this October, to learn more valuable lessons from women in leadership.